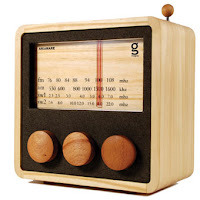 It's made of sustainably grown wood, it's a radio, it plays nice with your iPod, it slices, it dices, etc. Mainly, it's just a completely harmonious and lust-worthy design object from the tip of its adorably rounded antenna to its old-timey yet totally legible channel dial. From ReForm School.